Shouk opened quietly a year ago with zero fanfare - they have social media but not even a website. 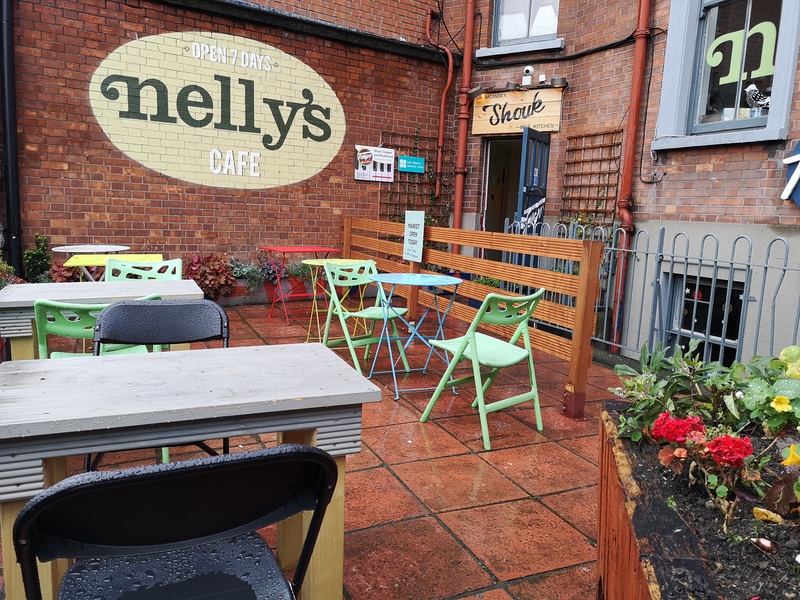 Slowly rumours started to go around about what sounded like a ramshackle operation on the grounds of St Pat's college in Drumcondra serving really exciting Middle Eastern food. Catherine Cleary reviewed it six months later and the word was officially out. 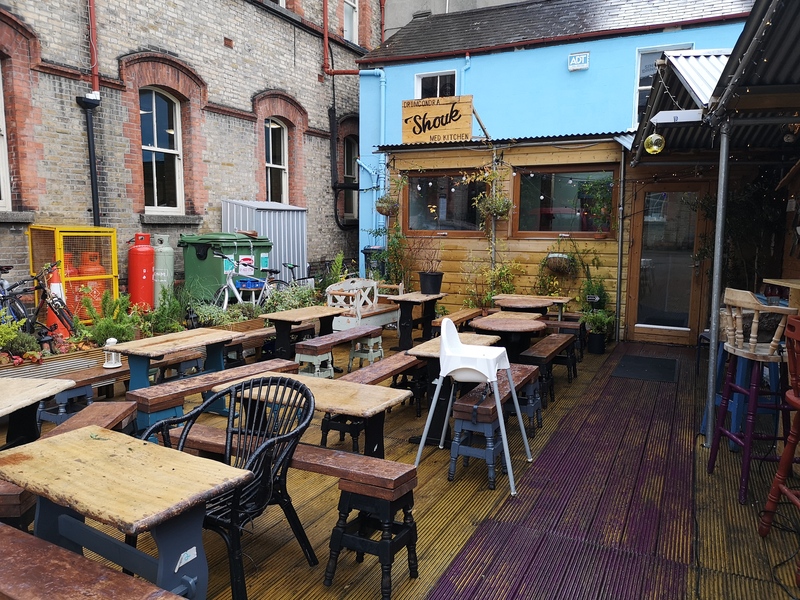 It's actually not in St. Pat's College, it's right next to the train station and the Arts and Business Campus, and it backs onto a yard with a few covered market stalls selling various handmade bits and pieces. 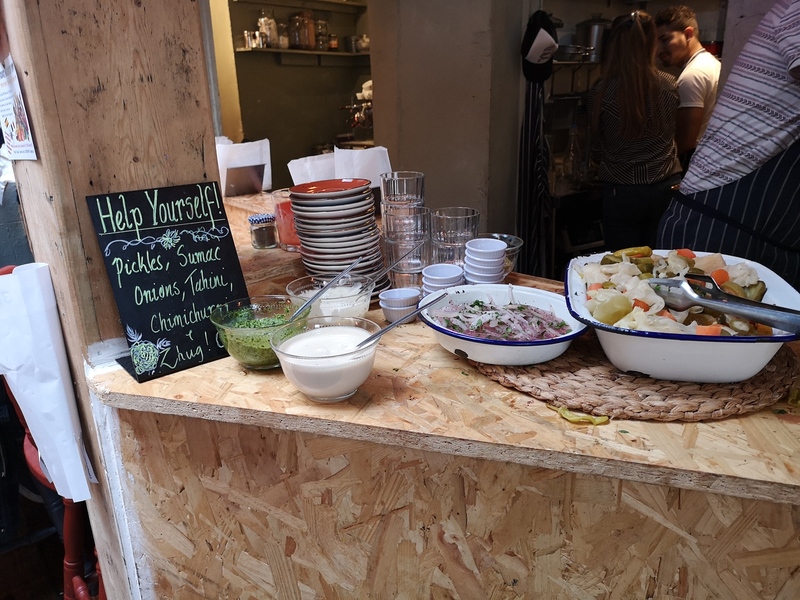 Owner Alon is Israeli with Irish roots, and insists on everything being made fresh, and it's in no small thanks to this that in 12 months Shouk has gone from suburban unknown to somewhere you'd be lucky to get in without a booking. This isn't really the land of wine or cocktails. 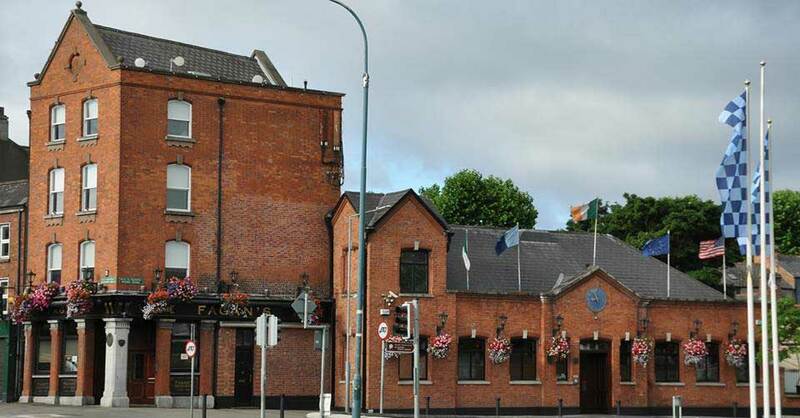 Your best bet would be a pint or a gin and tonic in Fagan's (Bertie Ahern's fav) or Kennedy's, or just go straight to Shouk which is BYO. 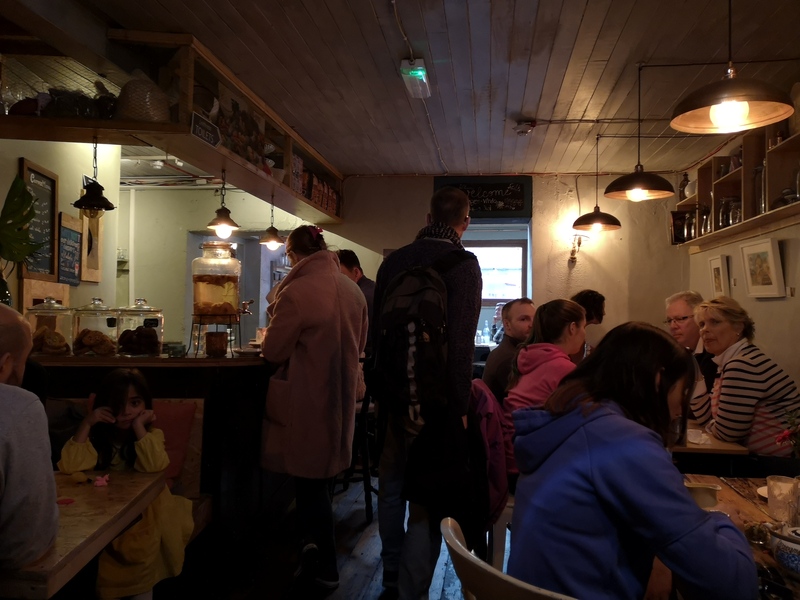 Inside is warm and 'cosy', with a few bar seats and tables which are quite close together, but we can guarantee it won't bother you much once the food starts coming. There's also a wonderful outside area which is a total suntrap and was the place to be during the summer. We were thinking of how sad it is that this space is going to go to waste for the next six months or so until the weather gets better again, when they told us that work is about to get underway on building walls to enclose the space that will be able to go up or down depending on the weather, as well as a retractable roof. Genius. Honestly? Everything. We've been three times and were wowed by it all. Don't miss the mezze platter, but be warned, it's enormous, so one between two (or two between four) is plenty, unless that's all you want to eat. Everything in Shouk is homemade and it's so obvious when you start eating. The flavours are so intense and vibrant, we spend most of our time there making yummy noises and shaking our heads rather than talking. You can order all of the bits separately from the snacks menu but the mezze is a really good overview of what the kitchen are doing. 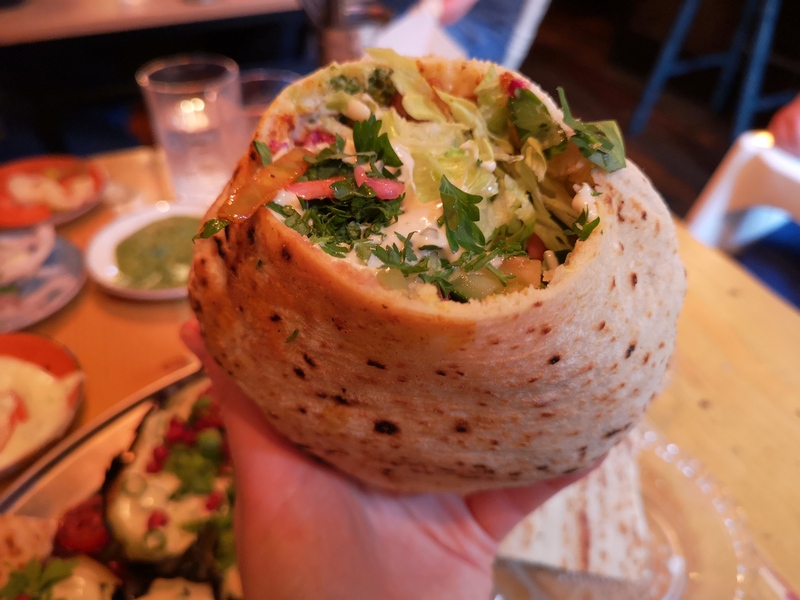 The chicken shawarma is another winner, albeit more difficult to share, and is packed with spiced chicken, pickled and fresh veg and loads of hummus in a fresh pita. For €8.50 it's one of the best sandwiches we've had this year. 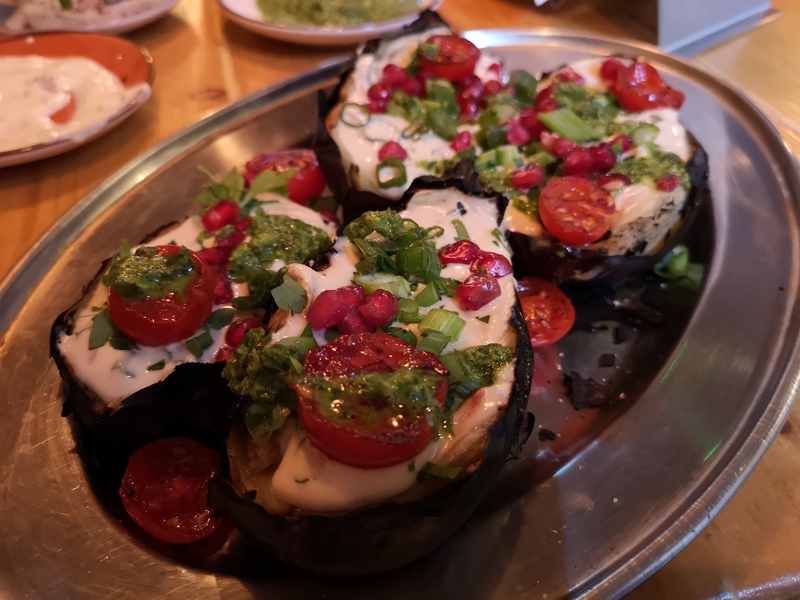 The menu is mostly vegetarian, and the chargrilled aubergine, with tahini, harissa, cherry tomatoes and more of that amazing pitta is as good an example as any to give meat a break. It is very charred and strong-tasting, so you might not want a whole plate to yourself but it's a definite if you're sharing. 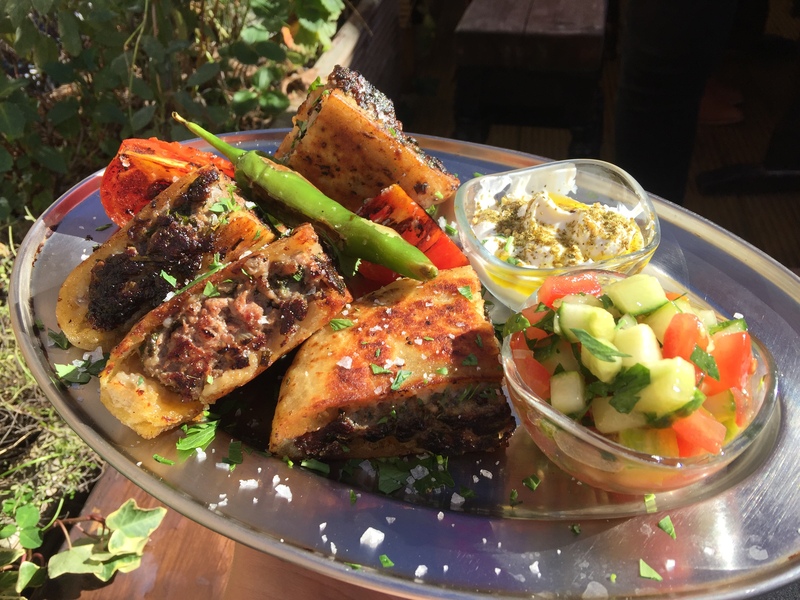 *Secret menu item alert* - Through some fortuitous twist of fate (an older member of a group asking where all the meat was) we discovered the beef and lamb arayes - stuffed pitta breads deep-fried and served with labneh, charred vegetables and a cucumber, onion and tomato salad. This is heavy and probably the least healthy item in here but oh so worth it - total table silencer. They're hoping to launch new menus soon and we're told this will be on there, but if not ask for it. They only had one dessert the last time we were there - Malabi, an Israeli milk pudding. Usually desserts like this wouldn't overly appeal, but our server convinced us to give it a go and we were so glad she did. 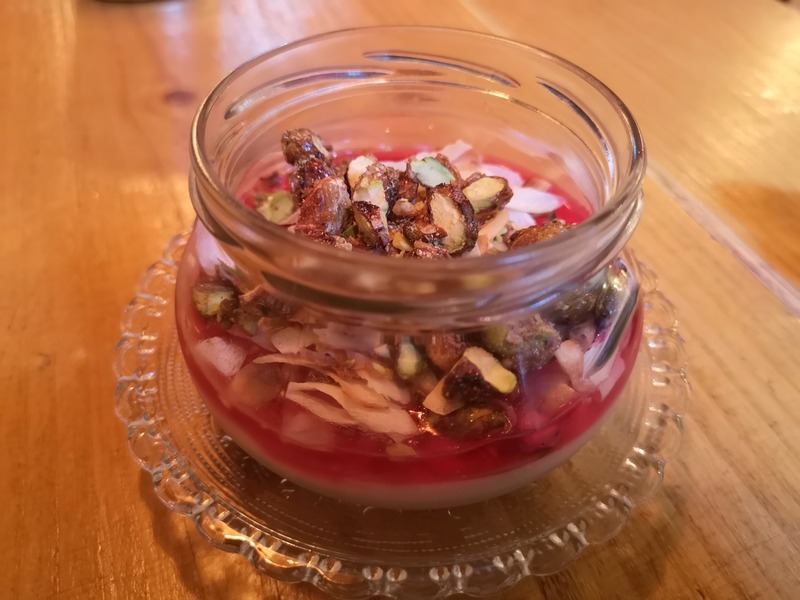 A coconut cream base was topped with rosewater, shaved coconut, caramelised almonds and pistachios, and was a perfect combination of lightness, zippiness and sweetness. We shared one and were very tempted to order another, but had already eaten our body weight in pitta so restrained ourselves. Another brilliant thing about Shouk is that it's BYO - €4 for wine, €1 for beer, but this might go up soon as it's very cheap. This started as they initially didn't have an alcohol license, but despite recently securing a wine list they're going to keep allowing BYO as it's been so popular - three cheers for Shouk. They're currently working on a wine list too so if you don't want to BYO (or forget to) they will have options. There's a really positive atmosphere in Shouk and everyone really seems to like working there. This is probably partly down to the fact that they are deluged with customers telling them how much they enjoyed their meal and can't wait to come back. It's like walking into a big love bubble. 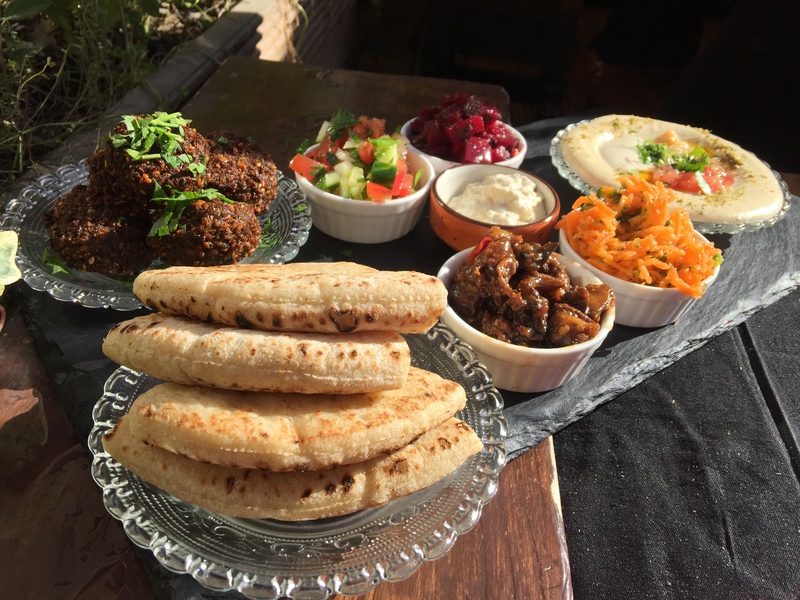 This the most exciting, best-value Middle Eastern food we've found in Dublin. The dishes and flavours set the bar for this style of cooking, and if we had this in Israel, never mind Ireland, we'd be delighted. 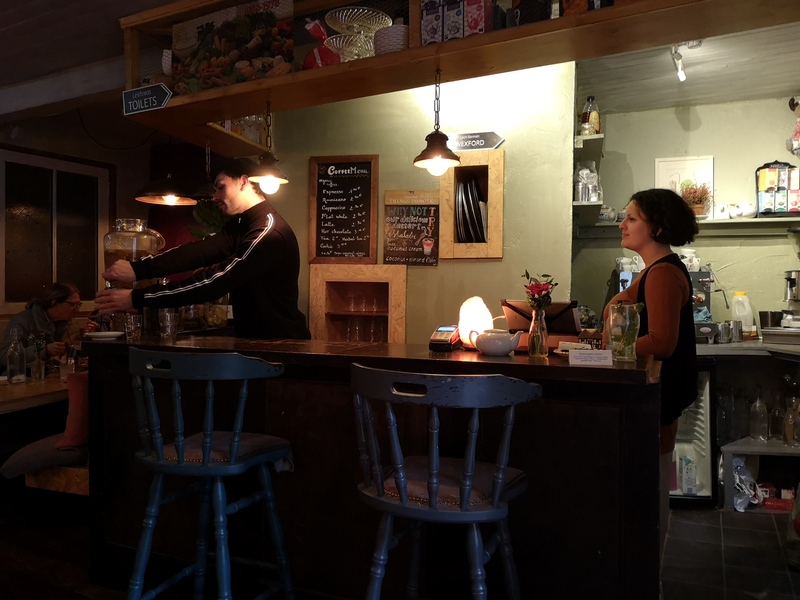 Every time we've gone the bill has seemed paltry for the amount and quality of food we had, and the fact that you can BYO makes it ideal for special occasions. Go soon, and be sure to book in advance. Open: Wed - Sat 12:30 - 21:30. Sun 12:30 - 20:30.